Toasted Walnut Arugula Pesto The Movie. When summer’s pesto runs out from the freezer I turn to arugula, which may farmers grow right through the winter in cold frames. I first posted the recipe here. It’s been a dry summer in Southern Virginia on the Chesapeake. Irrigation ponds are down four feet or more and many farmers have let row crops slide to take care of their livestocks’ drinking needs. on a personal – and far lesssignificant – level, this means that Ellis and Paul won’t be picking up crates of late season tomatoes on their Sunday drives home from the Northern Neck. My husband Jason has mixed emotions about this. 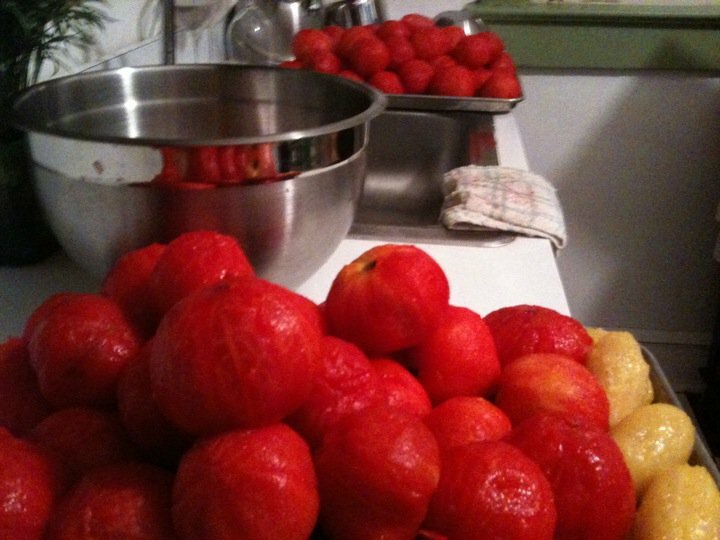 On one hand, it means no frantic Tuesday nights spend blanching, peeling and seeding a couple hundred tomatoes before they go bad. On the other, it threatens a winter freezer free of quart after quart of tomato sauce, preserving the fresh, bright taste of late summer tomatoes and licorice-y basil. I blame Jason’s conflicted feelings on Andrew Carmellini. 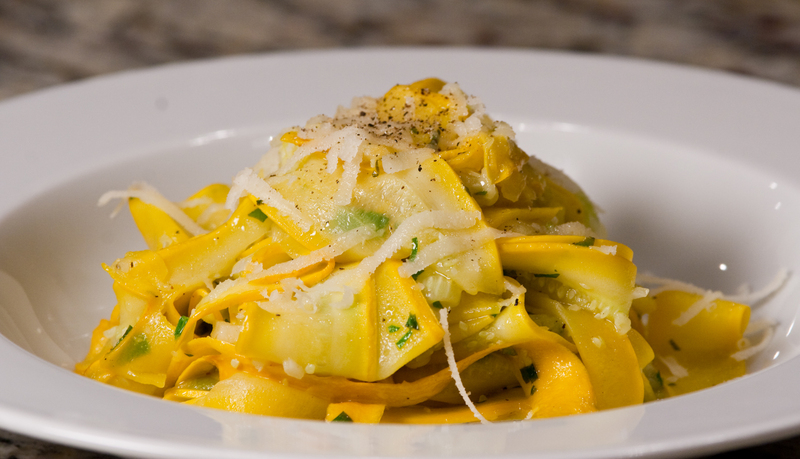 His cookbook, Urban Italian, contains a fresh sauce recipe so perfect that we haven’t changed a thing. It may be the one recipe I have never tweaked, not even a little. Lots of fresh tomatoes, cooked quickly and seasoned with basil and garlic-infused olive oil create a bright, sweet and spicy sauce, as easy and non-complex on your palate as it is to cook in 45 minutes per batch. In Ellis and Paul’s stead, I’m reaching out to Dan at Agora Farms, who can hook me up with the best tomatoes grown in Lancaster County, PA. Dan, we’re going to be needing tomatoes. And lots of them! 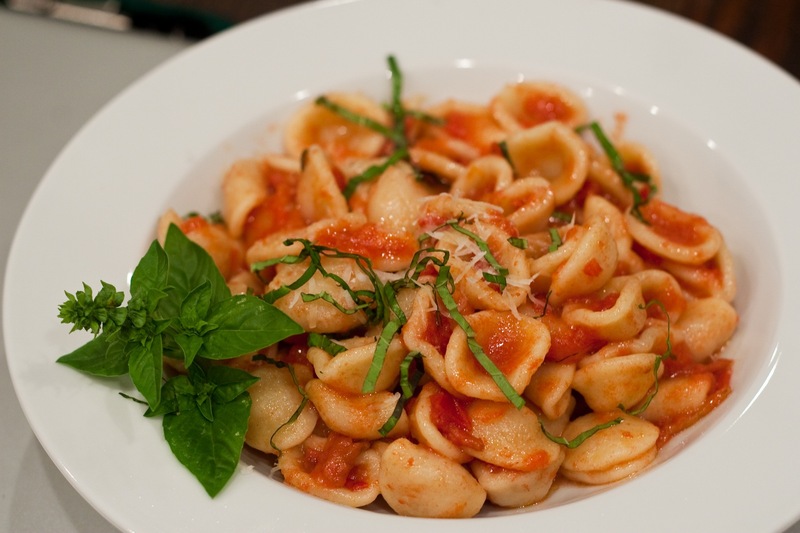 You can use plum tomatoes, like Romas or San Marzanos, for a richer sauce. I don’t even bother to peel and seed them. They will release a lot less water, so take less out and keep a close eye on them. *Three fresh tomatoes and a pound of pasta will make a hearty meal for four people. Don’t worry about being too exact on the infused oil proportions, just make a little less and add it to taste. **I’ll be using the spicy Sicilian oil from Sapore. To peel tomatoes, cut an “X” in the skin at the base and blanch them in boiling water until the skin wrinkles and cracks – 30 seconds to 1 minute. Shock the tomatoes in ice water. The skins will slide off easily. Return the water to a boil between batches. To seed tomatoes, cut in half and squeeze them over the sink, watch for seed explosions that will cover the walls of your kitchen. Laugh richly and keep going. 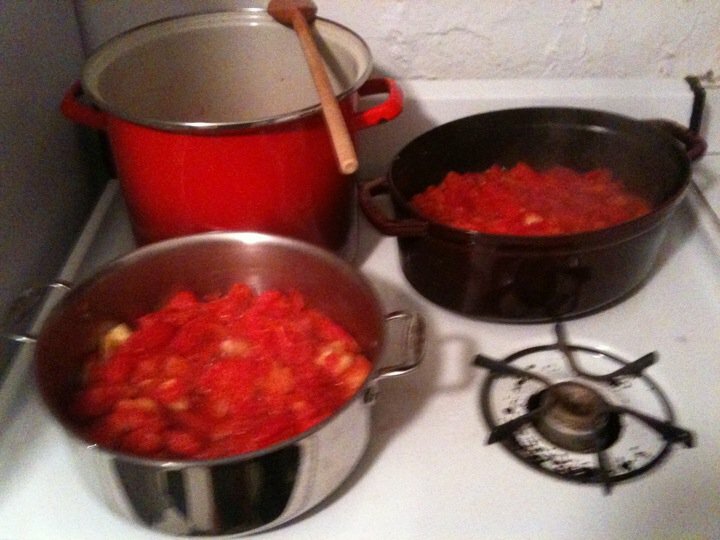 Chop tomatoes roughly and place in a large, shallow stock pot over medium heat. Sprinkle with 1 tsp salt. Cook tomatoes until soft and bright red, about 45 minutes. Remove liquid while cooking. A total of about 2-3 cups. You want the sauce to remain wet and liquid, but not soupy. Save some of the tomato water in case you take too much out early on. While tomatoes cook, place garlic, basil, pepper flakes and olive oil in small saucepan over medium heat. Simmer until basil begins to crackle and pop. Reemove from heat and let the flavors infuse the oil for twenty-ish minutes. Strain oil into tomatoes. Cook for ten minutes, stirring occasionally. Blend with masher or immersion blender. Absolutes are rare in cooking. Once you learn the basics of technique and flavor you can experiment freely – recognizing you’re going to bomb every once in a while and that every truly great dish has been practiced and refined over time. While researching broccoli rabe last week, I discovered an exception to this rule. Every single recipe I read began with blanching and included garlic and red pepper flakes. 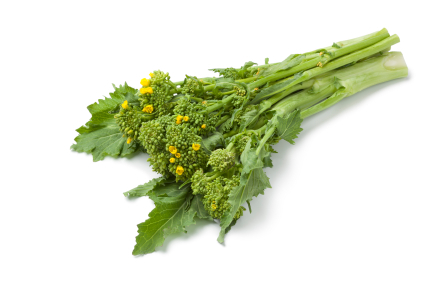 Now, I’m sure there’s an exception out there somewhere, but once I spent some time getting to know broccoli rabe, it all made sense. Though it looks like broccoli, broccoli rate is closer in relation to the turnip, another member of the brassica family, which includes cauliflower, cabbage, mustard and kale. 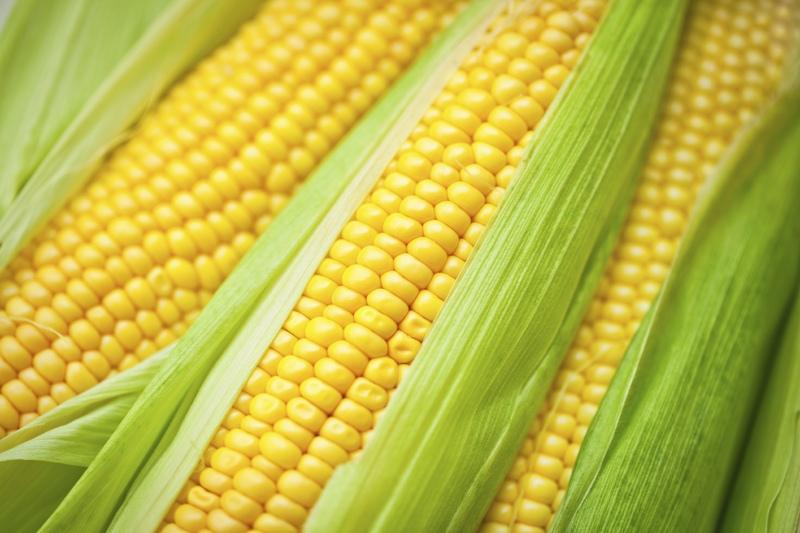 It has a sharp bitterness to it which is abated by blanching. The heat of the pepper flakes and richness of lightly browned garlic reveal subtler flavors in the rabe. While there is no sauce in this pasta, I used a common Italian technique of adding the pasta cooking liquid to the sauté pan, along with slightly undercooked pasta, and letting the dish come together while the liquid is absorbed or evaporates. This leaves the pasta almost as flavorful as the greens. More olive oil – the good stuff! 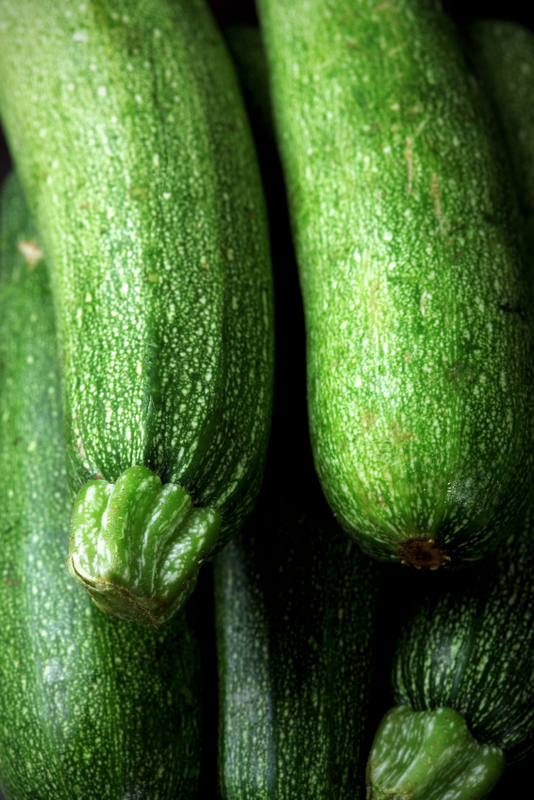 *Chop off the bottom 1/2″ of the stems, then peel them. If your rabe is very leafy, remove the leaves, blanch them separately, and add them about 2 minutes after adding the stems so that they do not become over-cooked. Blanch broccoli rabe for 1 minute in salted, boiling water and remove to ice bath. When cool, drain. Chop broccoli rabe into 1” pieces. Boil water and start cooking pasta. Heat oil in large sauté pan over medium low heat. Add garlic and cook until starting to light brown. Be careful not to burn. Add pepper flakes, cook for 30 sec. Add broccoli rabe and cook 2-3 minutes until crisp tender. When pasta is almost ready, drain, reserving two cups of liquid. 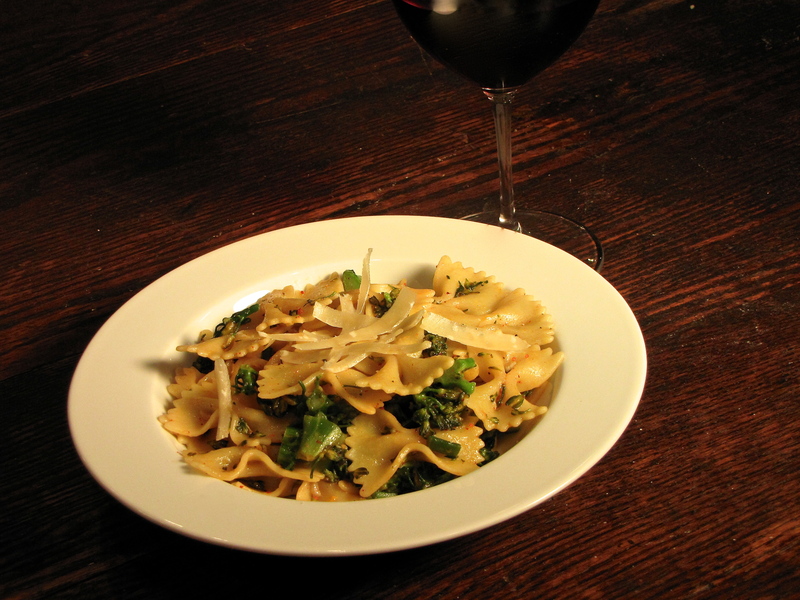 Add pasta and liquid to broccoli rabe. Cook until liquid reduces to coat pasta. Toss with oregano, additional olive oil, cheese, pepper and salt. These are not pictures of arugula walnut pesto. Marvin Ogburn from Long Meadow Farm emailed me one Friday morning. “I have A LOT of arugula this week. 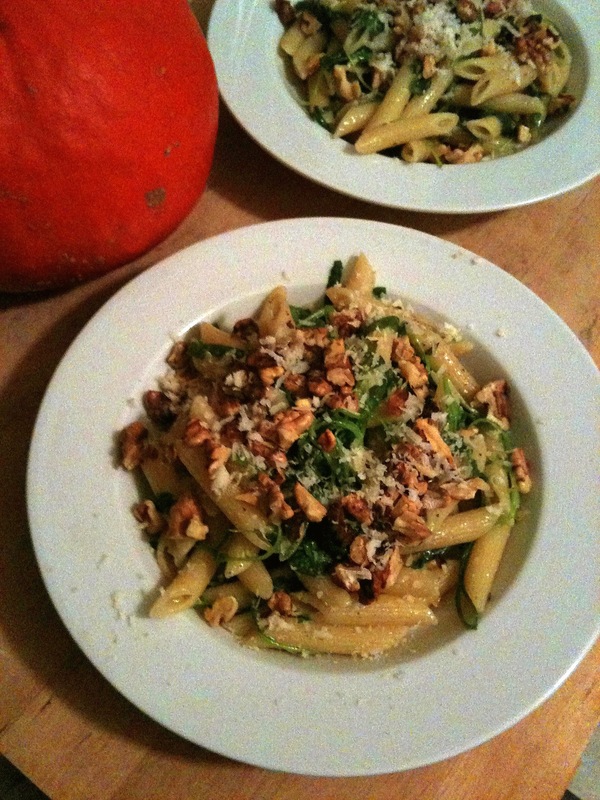 What can you do with it?” We headed to the kitchen that night and worked on an arugula pesto. Out of several variations we learned that blanching the leaves first removes too much of the arugula flavor, chopping the walnuts before lightly toasting them eliminates the raws taste without burning the outsides, and salt carefully – the cheese already adds a lot. We tested the recipe over pasta, but it was wonderful the next morning, at Eastern Market, over boiled and sliced fingerling potatoes. *Did you have a copy of Free Stuff for Kids when you were young? It was a list of free things you could send away for. Often they required so many boxtops or SASE’s that no one but a bored child would ever actually send away for them. I remember at least one or two required some small change, usually a couple quarters, to pay for printing of the edifying pamphlet describing banana spiders or the geography of Arkansas that you would receive in return. The instructions always admonished that the coins needed to be securely taped to your request letter. I assumed that not doing so would shame my elders. While this comment seems totally random, I am going somewhere with it. I really think you should try this recipe in a mortar and pestle. It’s a little more work, but the texture and control over the final product is well worth it. As an incentive, if you give it a try, send me an email at jonathan.bardzik@gmail.com. I will send you a letter of congratulations and two quarters. I’ll make sure they are securely taped. * Grate the parmesan on the middle side of a box grater. This gives you a nice bite of cheese and doesn’t get too gummy when pounded. 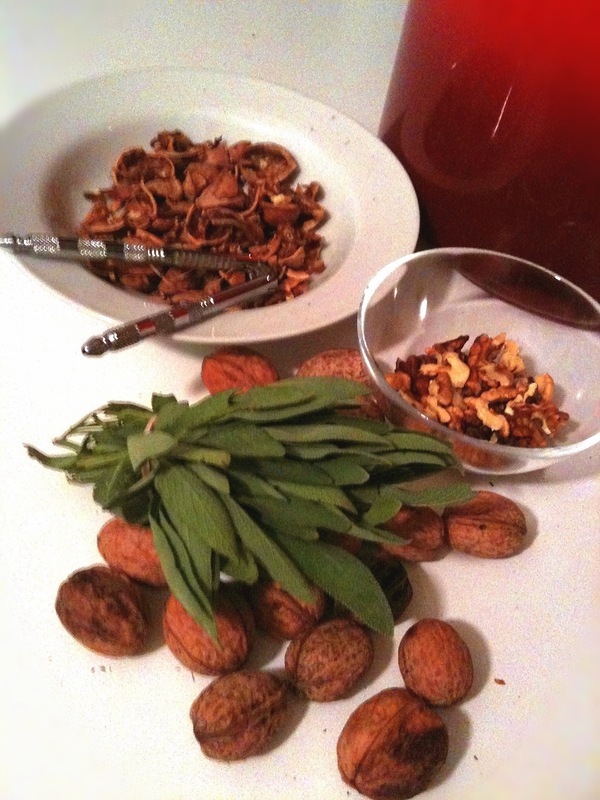 This can be made either by hand in a mortar and pestle, or in a food processor. Add garlic and a pinch of salt to the mortar. Pound garlic into a paste. Toast walnuts over low heat in a small fry pan. Watch carefully, nuts burn quickly. they are ready when golden and lightly fragrant. Add walnuts to garlic paste and pound until it looks like thick, chunky peanut butter. Add the parmesan cheese and pound until incorporated. Add the arugula a handful at a time and pound away. Add more when you have room in your mortar. Add cracked pepper to taste. Start with 5-6 grinds and go from there. Add olive oil to thin and bind. Start with a table spoon. You shouldn’t need more than two. Note: If your paste gets too thick during pounding, you can add a little olive oil to thin it out. Add garlic, walnuts and cheese to a food processor. Pulse until chopped together. About 4-6 times. Add arugula and process until coarsely blended. Keep it rustic as opposed to pureed. Remove pesto to a bowl. Stir in pepper, salt and olive oil.